Four years ago Joan became one of the every six Americans diagnosed with Alzheimer’s disease each year. The 69 year-old’s symptoms progressed quickly and her husband of over three decades, Brian, retired early from his job in order to care for her while their adult daughter lives with them in their Foster City home for added support. But living on a fixed income while coping with the challenges of caring for their loved one with dementia proved more taxing than the family had imagined. As Joan’s dementia advanced, it became more difficult for her family to connect with her, taking an emotional toll on everyone. The family needed to find resources to help them communicate with Joan, but supportive services seemed out of reach with their already-tight budget. 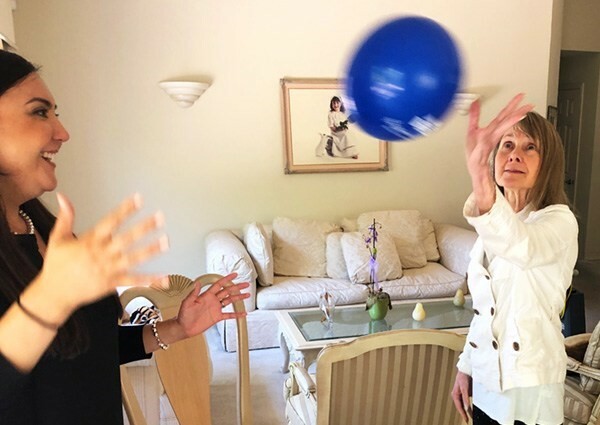 Andrea Korsunsky, Director of Seniors At Home’s Center for Dementia Care, demonstrates a memory enhancement activity from the CONNECTivity Toolkit with her client, Joan. Through a referral from a friend, Brian found Seniors At Home’s Center for Dementia Care. The family qualified for fully subsidized services and Brian was grateful to discover such a program existed to help them navigate the path ahead. After Brian connected with Seniors At Home, Andrea Korsunsky, Director of the Center for Dementia Care, visited the family’s home to show them how good communication can be key to enhancing quality of life for a loved one with memory loss. Initially the family was hesitant to include Joan, but Andrea emphasized the importance of her presence in the family discussion. She gently demonstrated ways to validate and engage Joan. Brian and their daughter talked about how Joan often becomes visibly frustrated, and Andrea role-played ways to anticipate her needs, show support through body language, and phrase things in a way to empathize with Joan’s frustrations. Andrea also brought with her the Center for Dementia Care’s recently launched toolkit, especially designed to help caregivers like Brian and his daughter. The CONNECTivity Toolkit empowers families to enhance quality of life and enjoy time with their loved one who has Alzheimer’s disease or dementia. The toolkit’s contents are based on the latest research and combine activity-based intervention with clinical expertise. It is the only dementia toolkit of its kind. A personalized consultation with a Seniors At Home dementia specialist is included with the toolkit, and its contents support every stage of dementia. The toolkit guides families through verbal and nonverbal communication and sensory stimulation activities, as well as self-care strategies for caregivers. The family has been very grateful to receive expert dementia care support from Andrea through in-person consultations and by receiving the education and tools they needed to better communicate with Joan. To schedule a dementia care consultation for your family, call Seniors At Home at 844.222.3212 or send us a message.